80-Quart Retro Coca-Cola Cooler. This officially licensed Refreshing Coca-Cola cooler is a decorative solution for storing the drinks you plan to serve for your festivities. The removable double lid allows you to fill the insulated poly liner with ice and beverages when the party calls for a round of tidbits. Additionally, the interior compartment of this 80-qt cooler has ample volume, so you can keep up with your thirsty guests. Featuring a design inspired by the iconic logo, this whimsical icebox is a union of classic charm and modern-day function. If you are serving brews in old-fashioned bottles, it comes with a built-in bottle opener and cap catcher. For an added touch of convenience, the stainless steel bar offers a place for you to hang a towel. This retro cooler has four casters for easy transport, and two of them can lock so the unit stays in place when unattended. You can easily drain the melted ice after the party’s over by pulling out the plug by its attached chain. 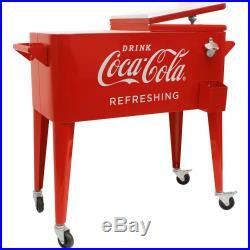 80-Qt Retro Coca-Cola Cooler “Refreshing”. Retro cooler measures 37″ x 15.5″ x 33.25. Stainless steel towel bar. Drain plug with attached chain. 80-qt cooler with 4 casters, 2 of which lock. Material – Resin, Metal. Color – Red, Coca-Cola Red. Assembled Product Dimensions (L x W x H) – 37.00 x 15.50 x 33.25 Inches. The item “80-Quart Retro Coca Cooler Refreshing Ice Chest Storage Metal Red New” is in sale since Wednesday, April 12, 2017. This item is in the category “Collectibles\Advertising\Soda\Coca-Cola\Coolers”. The seller is “fizestore” and is located in Orlando, Florida. This item can be shipped to United States.